Spectacular scenery, sunshine and warmth all year round, Madeira cake AND wine, make Madeira an attractive destination. Its varied appeal means it attracts a variety of travellers, so it can be difficult to know the best places to stay in Madeira for you. If you want a fun, sunny winter break and prefer a rock-bottomed sea to a sandy beach, prefer to fly - but not long haul -, then Madeira is for you. If you’re travelling with kids (of all ages), want a memorable, activity packed holiday and enjoy messing around in and on the water, then Madeira is for you. 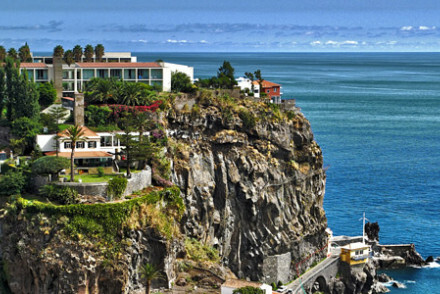 Madeira is also for you if you want want a relaxing spa break with a spectacular, sunny backdrop. Or if you want a walking holiday, to play golf or go big game fishing. It might not sound like a highlight when compared to the beautiful coastline and spectacular mountains, but Madeira’s levadas, the stone and concrete-lined waterways which distribute water from the wetter north to the drier south keeping Madeira looking so lovely and green all year round, make for fantastic walking trails. Once you’ve walked beside a levada for a bit you’ll have a new respect for the lush pleasures of Madeira’s famous botanical gardens, which are definitely unmissable. As far as that spectacular coastline goes, one of the ‘must-sees’ is Cabo Girão, the world’s highest ocean cliffs, which rise 590metres out of the sea! If you are up in the mountains you’ll not want to miss the São Vicente Caves, a series of fascinating lava tubes and volcanic caves. After appreciating the pleasures of the land you’ll also want to get out onto, or under the water. Madeira is a fantastic backdrop against which to kayak, sail, surf, snorkel or scuba dive. As far as cultural attractions go, Funchal’s Qunita das Cruzes museum, which was once the home of the captain who discovered Madeira, is aristocratic and fantastic. There’s also a great art museum and the incredible Mercado dos Lavradores, a market just bursting with smells and flavours. Madeira is frequently referred to as the ‘Island of Eternal Spring’, but it can be quite busy in actual spring and summer, so it’s a good idea to book into the best places to stay on Madeira as far in advance as you can. 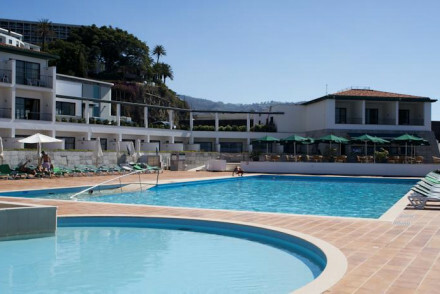 The Pencha da Franca is a large, seaside hotel just ten minutes from the centre of Funchal with 109 simple, comfortable rooms overlooking the sea or the hotel’s lovely gardens. As well as two large pools - one heated, one not - and plenty of watersports facilities, there’s also a lively games room. 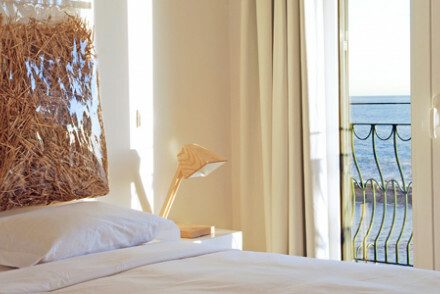 Pestana CR7 has wonderful sea views and quirky, colourful boutique decor. There’s an infinity pool on the roof and a jacuzzi. Reid's Palace is one of the best places if you're looking for an easy family holiday. There's plenty to do on the grounds, including multiple pools - one just for kids, an indoor play space and outdoor playground, supervised activities, including tennis lessons and they'll help you organise activities for the whole family to do together. They also have a large selection of rooms and suites. Five stars and family friendly don't always go together, but Quinta de Bela Vista offers it. This grand hilltop mansion also has amazing views and plenty of space. In addition to the pleasures of the island itself, Qunita da Casa Branca offers a wide range of spa and massage treatments, a sauna, yoga, a gym and a big, wonderfully calm garden. Qunitinha de são João is a wonderful Goan-Portuguese villa in central Funchal with 42 beautiful rooms and an extensive spa. As well as beautiful interiors the hotel has excellent Goan cuisine and serene gardens. Summerplace, to the island’s west side in Fajã da Ovelha, is an intimate guesthouse with just five guest rooms and magnificent sea views. The decor is charming and eclectic and you’re in a great spot for exploring the Madeira valley. The Casa Velha do Palheiro is a beautiful country house hotel with 37 rooms and a great position right next to a golf course. The decor is elegant, the restaurant gourmet, the spa fantastic and the gardens exquisite. Quinta das Vistas is a beautiful, 71 room five-star hotel with stunning sea views and great access to all the sights and tastes of Funchal. There’s a terrace restaurant and a top of the range spa. The Hotel da Vila's 15 rooms are bright and airy, but basic. 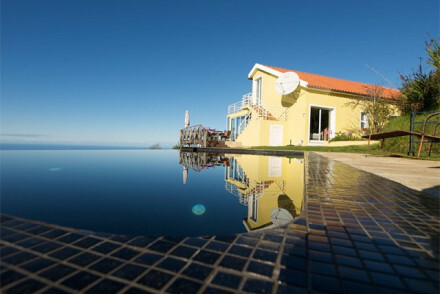 What makes this one of the best places to stay in Madeira for good value are the balconies with sea views, reasonably priced food and access to the excellent facilities of its sister hotel up the hill. Even the sister hotel is reasonably priced: with its sharp angles, clean lines, coloured lights and summer terrace parties complete with named DJs, Estalagem da Ponta do Sol is inexpensive but funky. The infinity pool with views out to sea make it the perfect place to relax in the day and party at night. 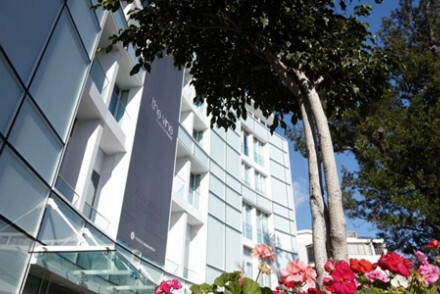 For inexpensive chic in Funchal try The Vine: it's big, super modern and has excellent spa facilities. And all for under £100 per night. Just east of Funchal at Santa Cruz, Madeira Airport is the island’s only one. There are direct flights from London and other major European capitals, but if you can’t find a suitable option you might want to fly to Lisbon and change for the 90minute TAP flight, which is quite inexpensive and runs twice a day. If you’re going to Funchal from the airport you can catch a bus, everywhere else you’re better off with a hotel transfer, taxi or hire car. If you want to hire a car - which we highly recommend if you want to see the island - we recommend you visit our online partner Rentalcars. Madeira has hot dry summers and mild, damp winters, with most of the rain between October and March. Temperatures are highly dependent on the winds coming across the island, with warm winds coming from North Africa bringing average summer temperatures of around 30°C and cooler winds from Europe keeping things in the mid-20s. Summer is the most popular time to visit, but autumn and late spring are lovely too. This is a super modern spa hotel with slick minimalist interiors, lengthy wine list, and panoramic views of Funchal. A sophisticated spa break for those who want to be pampered to the max in a city environment. This intimate guesthouse set on a cliff top with magnificent sea views is the perfect place to unwind. Beautifully decorated rooms with views and eclectic living areas with furnishings from around the world. A great escape for couples and a base from which to explore the Madeiran valley. Total relaxation - Mountain air and magnificent scenes of the Madeira countryside. Intimate - Not for those seeking anonymity, a very sociable guesthouse. Country Escape - Set on a cliff top with views out to sea. Views - Over the Madeira valley and out to see. A bright and breezy seaside hotel. Cheap-chic is the order of the day. Airy rooms with balconies and sea views. Excellent food and access to its sister hotel's excellent facilities just up the hill. Ideal for those on a budget.